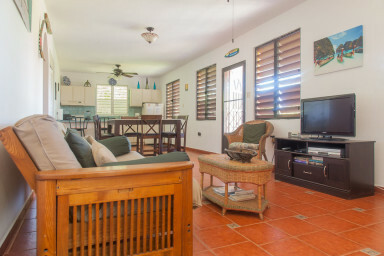 We look forward to welcoming you to our beautiful Casa Bianca, just steps from Sandy Beach. We're located in the Puntas neighborhood of Rincón, where there's fun and music in the air! This spacious 3rd floor apartment offers 1,020 sq ft of living space, plus a private balcony area overlooking Sandy Beach. It can comfortably accommodate a group of up to 6. Guests also have access to laundry facilities, and a shared roof-top terrace with BBQ grill and lounge area with ocean views. Apartment C is on the third level and has two private entrances with onsite parking. Each of the 2 bedrooms has a queen size bed, quiet inverter air conditioning and access to a private bathroom. There is a futon in the living area which can sleep up to 2 additional guests. The living area has cable tv and there is free Wi-Fi throughout. The kitchen is fully equipped with a full size stove, fridge, dishwasher, microwave, toaster, coffee maker, dishes, utensils, pots, pans, etc. This apartment has 2 bathrooms with a shower as well as an outdoor shower. The house property manager is just a phone call away and will be available to assist guests throughout their stay. We are within walking distance to some of the finest bars and restaurants on the island! Tamboo, Casa Verde's Saltaire, Ode, Pool Bar Sushi, Island House, Kabanas are just a short stroll from here. Sandy Beach, Pools Beach, Parking Lots, and River Mouth are all within close proximity. Snorkel, surf, paddle board, yoga, kitesurf all right here! We are also within 5 minutes of the Rincon lighthouse, Maria's, Domes Beach, Steps Beach and the Tres Palmas Marine Reserve. The downtown area and Rincon Plaza is also within a 5 minute drive. A rental car is not necessary here since there are several places to eat and things to do within walking distance; however, it is recommended to get the most out of your stay. Taxis are available on call, but sometimes car rental rates can be cheaper than cab fare to and from the airport. Casa Bianca is set back on a lush private property. We are less than a minute walk from Sandy Beach. Within walking distance there are several bars, restaurants, and small boutiques. Barrio Puntas comes to life on the weekends with live music and dancing at some of the near-by restaurant/bars. Take a surf lesson, paddle board, take a yoga class on the beach, or just stroll the miles of pristine coastline. You won't have to go far to have a great vacation at Casa Bianca. Additional fees: a 7% lodging tax will be added to the reservation total. No other fees.